“If you want to be remembered after you die, either write something worth reading or do things worth writing” – Benjamin Franklin. Certainly in the second half of the 20th century, the above quote can be applied to the life and legacy of Rabbi Moshe Sherer ZT”L, world -renowned leader of Agudath Israel of America and of world Jewry. In fact, this quote was just one of the many hundreds found on slips of paper in the files of the late leader after his passing. Those files, along with impeccable notes, documented and recorded for posterity a career that spanned over 55 years in selfless service to Klal Yisroel and Reb Yisroel. They are the centerpiece and foundation for the biography of the legendary leader’s life, just released by Artscroll/ Mesorah Publications. As one of the many fortunate to grow up in Camp Munk, a memorable part of my childhood was spent being regaled and captivated by the legendary head counselor and famous Pirchei director, Rabbi Joshua Silbermintz Z”TL (lovingly known as Josh) as he introduced us to the great leaders of Klal Yisroel’s past. Week after week and summer after summer, a venerable who’s who of Torah giants and renowned luminaries came to life through the eyes and magical stories of this legendary Mechanech. Like others, I am sure; I began to develop an appreciation for those incredible men of action “our” Yiddishe heroes. The life and times of Reb Elimelech (Mike) Tress ZT”L and Rabbi Moshe Sherer ZT”L came alive on those Shabbos afternoons. Rabbi Silbermintz himself had grown up amongst many of them (like Mike Tress)and if we campers were to take away any of their lives’ lessons, he knew he had better do a good job selling us. Boy did he ever. Rav Shraga Feivel ZT”L was no longer some long-lost figure; his activities and his Gadlus were specially packaged for our consumption, up close and personal. Rav Aharon Kotler ZT”L and other Gedolei Yisroel like Rav Gedaliah Schorr ZT”L, and the Kapitchintzer Rebbe ZT”L, heroes of a generation past, stirred our young hearts to strive for greater heights. The heroic generation of the Shearis Hapleitah and the awe-inspiring work of the Vaad Hatzoloh created for us, new role models we could really believe in and pattern our lives after. Chinuch at its best – by the best. And so it is now, eleven years since the Petira of Rabbi Moshe Sherer, Artscroll/ Mesorah has finally released the long awaited and highly anticipated biography of Rabbi Moshe Sherer, majestically written by renowned author Yonoson Rosenblum with an inspiring foreword by Rav Shimshon Sherer. It is the real-life story of a man who rose to the very pinnacle of leadership, a position of such importance and responsibility that Gedolei Yisroel whose very names still inspire awe and reverence – Rav Aharon, Rav Moshe, Rav Yaakov, Rav Hutner ZT”L, etc… placed their greatest confidence and trust in him. A confidant and advisor to Presidents, Governors, Senators, Mayors, and lay men alike, Rabbi Sherer was a man whose honesty and integrity was renowned throughout the halls of power and across the world. Rabbi Moshe Sherer was the paradigm Osek B’tzarchei Tzibbur and the model and barometer all others will be forever judged by. For the many that did not have the good fortune to experience the guiding idealism of a Rabbi Josh Silbermintz, a second chance to explore in detail the courage and triumphs of those challenging post-war days has now become available with the completion of this new monumental work. The narrative of one of the most compelling and revolutionary life stories is now available for all. “Rabbi Sherer: The Paramount Torah spokesman of our era” is a must-read for those who feel a call to duty and wish to align themselves with Torah true Hashkofah—Mi L’hashem Eilay. Hope and optimism reign supreme as Klal Yisroel found a way, against all odds, to rebuild after Churban Europe, with Rabbi Moshe Sherer side by side with Mike Tress, loyally positioned at the flank of America’s greatest Torah giants. Following the Petira of Rabbi Sherer, Rav Elya Svei ZT”L, the late Philadelphia Rosh Yeshiva, instructed Rabbi Shimshon Sherer, son of Rabbi Sherer and Rav Elya’s talmid, to produce a handbook based on his father’s life story, ( worthy enough) to impart the many lessons of Rabbi Sherer’s activities, for future Klal Askonim. Though it took ten years of exhaustive research and effort, the overwhelming reaction and consensus of today’s most prominent and respected Torah Shtadlanim is, that Rav Elya himself would have approved the final work, a true masterpiece. Torah activist, eloquent spokesman, defender and voice for authentic Daas Torah: it is truly impossible to encapsulate or label who Rabbi Sherer was and what he meant to Orthodox Jewry. What the book does chronicle in generous doses is the “behind the scenes” view of the most famous and critical events that presented themselves during Rabbi Sherer’s 55-year tenure at the helm of Agudas Yisroel. This book weaves the life story and meteoric rise of Moshe Sherer taken under the tutelage and wing of some of Klal Yisroel’s most awesome figures, including the Baranovitch Rosh Hayeshiva Rav Elchonon Wasserman HY”D. Reb Shraga Feivel had prophetically appointed a young Moshe Sherer to accompany Rav Elchonon from his hotel to Mesivta Torah Vodaath during Rav Elchonon’s last visit to America in 1938. Rabbi Sherer, as the book elaborates, would later describe his contact with Reb Elchonon and the experience of being his attendant as “a turning point in my life in a big way”. With incredible foresight, Reb Elchonon taught the young yeshiva student that being a leader required the ability to ignore criticism and that leadership is not a popularity contest. In his talks to the young fledgling Agudah groups, Reb Elchonon was, in Rabbi Sherer’s words, “not only an Agudist in theory, he was Kulo Agudas Yisroel-the real thing.” Reb Elchonon made the concept of Daas Torah come to life. He would stand at the front of the room, with a Chumash in hand and tell the assembled boys that everything is found in the Torah. “Freg a Kasha! (ask a question)” he would tell them, and they would pepper him with questions about everything that was on their minds, such as Hitler’s quick ascension to power and other world events. To any question, the venerable Rosh Yeshiva would jump up and say, “It’s an explicit verse in the Torah” or “its an explicit Chazal.” As the book delves further into the formative years that produced what was to become the quintessential Klal Yid, it becomes clear that Rabbi Sherer’s interaction with Reb Elchonon, Rav Shraga Feivel Mendelowitz, Rav Yaakov Yitzchok Ruderman and of course the Gadol Hador, Rav Aharon Kotler deeply impacted him. Developing those close relationships showed him time and again, Daas Torah’s astounding capacity to read the events of the world through the eyes of the Torah. These real time sessions provided the impressionable future leader with the truest meaning of what authentic Daas Torah is. These lessons in “Avodas Haklal” would serve Rabbi Sherer well in his daily dealings with Gedolei Torah in the years to come. “Rabbi Sherer: The Paramount Torah spokesman of our era” tells of a brilliant man with matchless energy, creativity, and passion, all bound together to serve Klal Yisroel and Gedolei Yisroel. His combined power and command of Torah and secular subject matter made him indispensable to the Torah leaders of the day and served only to enhance K’vod Shomayim as he developed Agudas Yisroel into the powerhouse organization it is today. Rabbi Sherer was a relentless fighter and advocate for a needy and grateful Klal; his accomplishments on behalf of the Jewish nation are still obvious today and with Hashem’s help promise to remain extant for years into the future. Case studies, Vertlach, Divrei Torah and sagacious advice from the greatest Manhigim have been interspersed with real life issues and crises. Chapter by chapter, the reader comes to understand and appreciate how Rabbi Sherer, the regal and distinguished Jewish representative, was perceived by the secular world and how he saw himself. With Kiddush Hashem as his constant barometer, Rabbi Sherer embarked on major projects to enhance and facilitate Torah and Yiddishkeit. From the wartime Vaad Hatzoloh and Hungarian Rescue campaign to the Iranian rescue committee and the countless secret initiatives to save Syrian and Russian Jews, Rabbi Sherer publicly and privately was the master conductor of countless operations to save Yiddin across the globe. As one of few “Orthodox Jews” that public officials knew and respected, the heightened sense of responsibility to protect and advocate for Klal Yisroel, globally, fell on his shoulders. As Klal Yisroel in general struggled to emerge from the destruction of post-war Europe, no other figure in religious American life played such an all-encompassing role in the spread and defense of Orthodoxy world-wide. 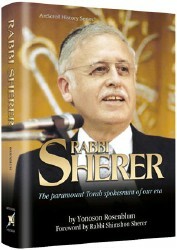 From the Vaad Hatzoloh years to the crushing loss of his mentor and cousin Mike Tress, the book takes its readers on a captivating tour, including a vivid description of post-war America, where Sabbath observance was not tolerated by secular employers and religious workers expected to be fired for keeping Shabbos. Rabbi Sherer set out to transform all difficulties facing observant Jews, and the book describes in detail the immense, and successful effort to finally receive government protection for Sabbath observers through the pen of then NY Governor Nelson Rockefeller, a close ally of Rabbi Sherer. Rabbi Sherer’s congressional testimony in 1961, testimony that ultimately resulted in groundbreaking aid for parochial schools, set Agudath Israel on the path to become the preeminent force and advocacy organization for Torah Jews in the United States. The very idea of government assistance to Yeshivos was so revolutionary and foreign at the time, that in the face of so much cynicism about his efforts, Rabbi Sherer went to discuss the matter with Reb Aharon Kotler who encouraged and advised “if Hashem wills it, nothing is impossible.” Rabbi Sherer’s testimony was (now famously) featured in the March 30, 1961 edition of the NY Times and broke many previous stereotypes about Orthodox Jews. Catching the eyes of Congressional leaders and other power brokers, his testimony also caught the attention of President John F. Kennedy who invited Rabbi Sherer to join a delegation of eleven other leaders of major Jewish organizations to hear their explanations for an upcoming American vote in the United Nations considered unfavorable to Israel. The inclusion of Agudath Israel was unprecedented and reinforced the message that American Orthodoxy had indeed arrived. Rabbi Aharon Kotler was emphatic, as the book continues, that Rabbi Sherer attend the Tisha B’av meeting and that he should shave and wear proper leather shoes (with sand inside as a reminder that it was Tisha Bav). In fascinating description the book clarifies how Rav Aharon spoke on the phone the night before, discussing all of the relevant issues that Rabbi Sherer would need to present to the President of the United States. As Rabbi Sherer described, “though Rav Aharon did not read secular newspapers or listen to the radio, he had fully anticipated the direction and the discussion which the President would take. At every turn, the case for Eretz Yisroel made by Rabbi Sherer was exactly as Rav Aharon had prepared with him. Rabbi Sherer always referred to the Rosh Yeshiva’s influence on the entire direction of the talks in the White House as proof that the great Talmidei Chachomim are not only adept at unraveling the intricacies of difficult Gemoras but also possess a clarity of vision in respect to world events. The seeds planted then, still play a major role in nearly every piece of legislation, that affects the Jewish community both locally and nationally to this very day. Along the way, thousands upon thousands of “Teiyere Breeder Yiddin” were helped and assisted personally and professionally by Rabbi Sherer and Agudas Yisroel and this book in vivid description provides the reader with case-by-case studies of the arrival and rise of Orthodox Jewry in America. This book is an important historical document that will serve as a handbook for a new generation of communal activists to study. What remains clear, as the Novominsker Rebbe Shlita somberly expressed in his Hesped at the levaya over eleven years ago, “Rabbi Sherer was a special matana (gift) to our generation”, and this powerful historic book tells the whole story of this extraordinary human being. Rabbi Sherer was not only an “Osek B’Tzarchei Tzibur”, as noted above; he was an “Osek B’Tzarchei Tzibur _Be’Emuna_”. Because others could tell that he was not in it for his own sake, they respected him even when they did not agree with him, and were willing to work with him on those issues where they had common cause.